Today we are happy to feature a guest post by Marianne Brandis, an award-winning author from Stratford, Ontario known for her historical fiction, biography and memoir. Marianne shares with us her process for researching and developing the fascinating texts that provide social, historical and ecological information in The Grand River: Dundalk to Lake Erie, now available from The Porcupine’s Quill. For the writing of the text of The Grand River: Dundalk to Lake Erie, I drew on both imagination and research: imagination because the work required me to do the most intense kind of seeing, and research to keep the “seeing” rooted in reality. Riverside buildings in Elora, Ontario. “Intense seeing”, or imagination (in the sense in which I’m using it), is observing what is there but also seeing into, or seeing through it—layers that include envisioning what the object or location might have looked like in the past, what it shows about how humans create and relate to their world, and what natural processes (visible or invisible, fast or slow) are going on. It involves meditating on the implications of what I’m looking at—what it means. A cleared field speaks to me of the pioneer’s labour in clearing it, but also of the effect that deforestation had on the river and the people living along it—flooding in spring, disastrously low water in summer. A horseshoe makes me reflect on the blacksmith who made it, on the importance of blacksmiths in early settlements, on the horse-drawn vehicles and farm equipment that were essential to pioneer life. 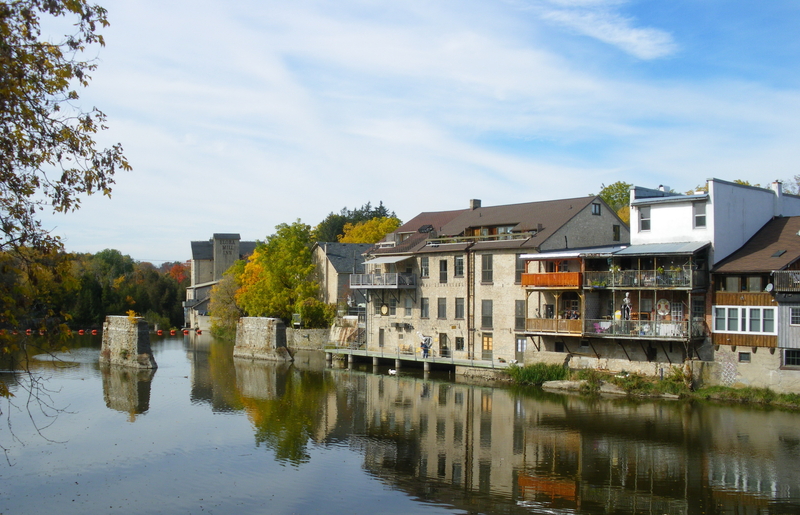 Thinking deeply about the aspect of the town of Elora shown in the image brought me to the sudden realization that the riverside buildings are an uncanny echo of the rock cliffs of the nearby Elora Gorge. The seeing involved in the creation of a book like The Grand River is not fairy-tale stuff but reflection, insight, and an understanding of the invisible as provided by the informed imagination. Such imagination and reflection on deeper meanings interweave with the “research” part of the project because what the “seeing” produces has to be put into a context—historical, environmental, human. I can daydream all I want about a building’s romantic history, but the actual structure has to be understood in the context of its architectural details, its function or sequence of functions, the story of its builder and occupants, alterations made to it over time, and its relationship to its past and present surroundings. Most of these aspects are not visible now and are therefore not depicted in the book’s illustrations: they have to be researched, and I deal with them in my text. View of the Grand River. And the delving for the invisible aspects can go beyond that. For instance, when I wrote about the post office in Fergus I thought about the transportation of mail over the centuries, and about how important postal service was both to the early settlers themselves and to the friends and family they left behind. The research takes place before, or parallel with, or after the process of imagination. In practice they are not separate: both draw on decades of reading, working with maps and old pictures, visiting historic places, and reflecting on events and patterns in history. This is what makes it possible for me to write, as I do in the Introduction to The Grand River, that in my text I move from the visible—depicted in Gerard’s wood engravings—to the invisible. It is also what gives The Grand River dimensions and meanings that reach far beyond this specific river in this specific time. And sometimes research is sitting by a beautiful river on a lovely day, soaking up what is there. Thanks again to Marianne and Gerard for the two excellent guest posts granting us a sneak peek behind their creative processes. 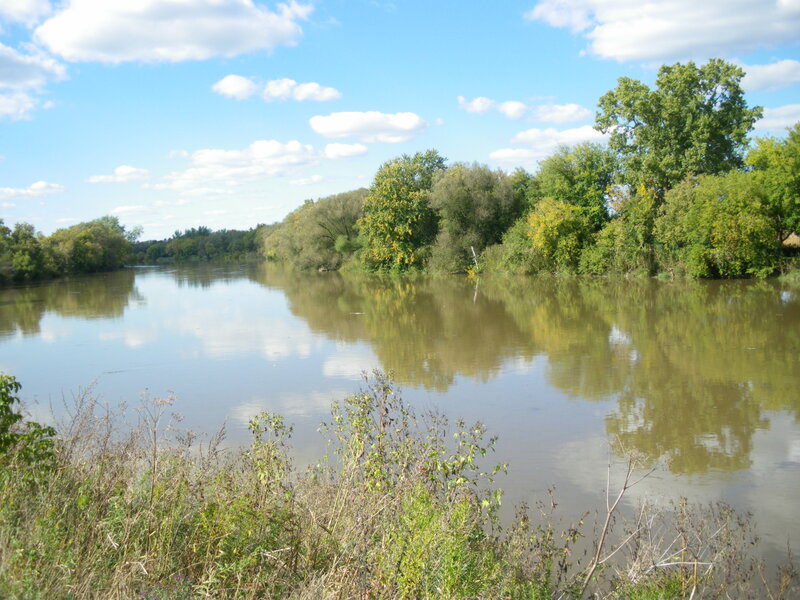 If you haven’t already, don’t forget to read Gerard’s take on creating The Grand River here on the blog. For more information about the book and where you can get it, visit The Grand River on our website, and be sure to check out Marianne Brandis’s and Gerard Brender à Brandis’s websites if you’d like to find out more about their work. Gerard and Marianne will be interviewed on Daytime (Rogers TV, Cable 20) on Monday, May 25. The interview will run at 1:00 p.m., 3:00 p.m., 5:00 p.m., and 11:00 p.m. so tune in at your convenience. You can meet Gerard and Marianne at The Grand River book launch at 7:00 p.m. on Friday, May 29 at the Preston Library in Cambridge. The launch will include an exhibition of the 66 wood engravings Gerard created along the river as well as short talks by both artists. Be sure to purchase your copy and get it signed. This entry was posted in Letters from the Porcupette (the Intern's Blog) and tagged Marianne Brandis, The Grand River, writing. Bookmark the permalink.